Greetings from windy and cold Helsinki! It has been a busy January! We normally try to complete scheduling and planning all of the upcoming year as thoroughly as possible by end of January. We seem to have a lot of traveling this year although quite a few personal climbs as well! We will first fly to Kenya and Tanzania on Jan 29th for Aventura’s Mount Kenya & Kilimanjaro trek. It is already my 9th time on Kili! After the treks I’m leading a 7-day game-drive safari at Ngorongoro, Lake Manyara, Tarangine and Serengeti National Parks. It is only in East Africa where you can with such an ease arrange a good trek and an amazing safari in just 10-14 days time. Look forward to spectacular photos! For that matter, please find me on Instagram! Please remember that from all the treks and expeditions I tweet every day at Twitter! Thanks to SPOT tracking device, our near real-time tracking is viewable here (only in operation during trekking)! Spring season will be fully booked for personal climbs. For quite some time I haven’t had a change to visit Chamonix Alps so am looking forward to a fun 2 weeks in the area in early March. Mid-April will see me in Kathmandu for the big project of the year. It is now confirmed that I will be attempting Kangchenjunga, which at 8586 meters is the third tallest mountain in the World. I will be climbing solo above BC and without aid of supplementary oxygen. Route of ascent will most likely be the 1979 British route on mountain’s North face. Summit attempts are very likely to be scheduled after May 20th. Follow the trip through Twitter and our web! July will also be for personal climbs although I have not yet decided on objectives. In August-September I will be leading a short trip to Elbrus (5685m.). We still have spots available so please join through Aventura here! Annapurna Circuit, 25.9. – 12.10. Annapurna Basecamp, 11 – 24.10. Manaslu Circuit, 15.11. – 7.12. Please do browse Altitude Junkies for our unique Cholatse climb! This is a technical snow / ridge climb on one of the most striking peaks in Everest region. This is a perfect alternative is you’ve ever thought of Ama Dablam but don’t want the crowds. I will be co-leading this with Phil Crampton and I bet it is going to be the most fun trip of the year! Last trip of the year will be an Aconcagua Expedition by Aventura! We already have bookings so please let the office staff know well in advance if you are interested! The trip will start after Christmas and go through Normal Route. Details here! So another busy year climbing and trekking! Love it and I am sure you will too! Please email me at samuli@samulimansikka.com for enquiries on all the trips! Find all the upcoming trips here! 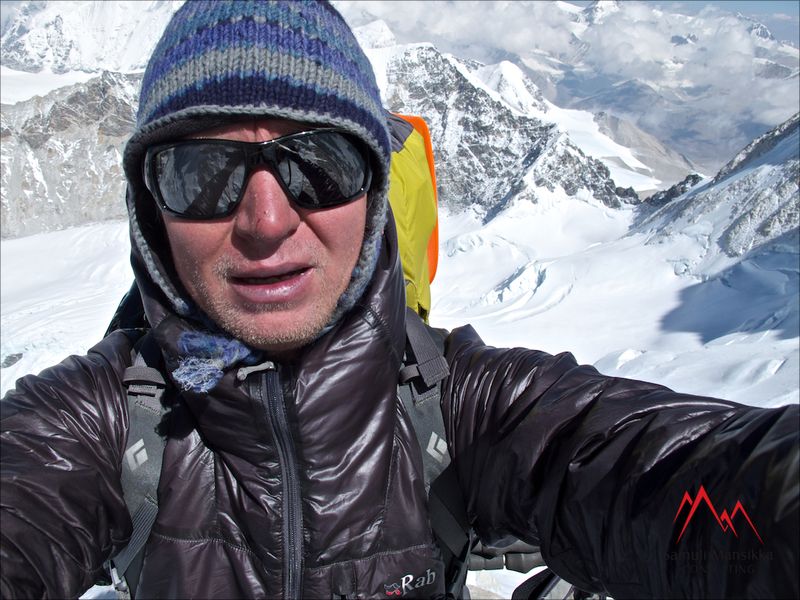 We are happy to confirm that Samuli is attempting Kangchenjunga in April-May 2014! At 8586 meters Kangchenjunga is World’s third tallest mountain and considered as one of the harder 8000-meter peaks. Samuli will be climbing solo above Kangchenjunga basecamp (5500m.). Route of ascent will most likely be the Normal route on mountain’s South Face (British 1955). No bottled oxygen will be used. Trip starts in Kathmandu in Mid-April. Kangchenjunga is located in eastern Nepal bordering to India and it is approached via Ilam and Suketar. Kangchenjunga on Wikipedia here. Kevään 2014 projektiksi on varmistunut Kangchenjunga! 8586 metriä korkea Kangchenjunga on maailman kolmanneksi korkein vuori ja pidetty yhtenä vaikeimmista 8000-metrisistä vuorista. Samuli kiipeää perusleirin (5500m.) yläpuolella yksin ja ilman pullotettua happea. Nousureitti tulee todennäköisimmin olemaan perusreitti vuoren eteläseinällä. Matka alkaa Katmandusta huhtikuun puolivälissä. Seuraa matkaa kotisivuilla ja Twitterissä!